Lindsey's Carpet & Tile Care has been cleaning, restoring and refinishing man-made tile, natural stone tile, and grout in the homes and businesses of Tucson and the surrounding areas since 1994. 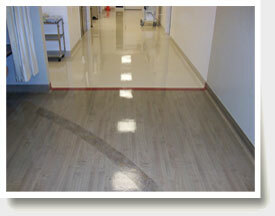 We offer our customers the highest quality Tucson tile cleaning & restoration services available. With our training, knowledge, and expertise in natural stone tiles such as flagstone, limestone, travertine, slate (just to name a few); in man-made tiles such as ceramic, porcelain, vinyl, and VCT tiles; and in grout, our customers can expect amazing results! Lindsey's Carpet & Tile Care uses one of the most powerful truck mounted cleaning systems, uses safe natural stone and man-made tile cleaning agents, and takes the time necessary to ensure complete soil removal. Lindsey's Carpet & Tile Care not only specializes in residential and commercial tile and grout cleaning, refinishing and restoring, but also in residential and commercial carpet cleaning, upholstery cleaning, and leather cleaning and conditioning. Much like carpet and upholstery, tile and grout can become soiled and stained by many of the same contaminants such as dirt, oil, tar, grease, liquids, food, and make-up. There are four very important factors that must be present to remove these contaminants. They are: cleaning agents, heat, agitation, and time or C.H.A.T. As in carpet cleaning, these four factors work together to produce spectacular results. Our cleaning agents are not only safe for man-made and natural stone tiles, but have the necessary detergents to facilitate the emulsification necessary for complete soil removal. We allow the cleaning agent to dwell for the desired time so that emulsification and breakdown of the soil and oils will be complete and result in easy removal. Our truck mounted system allows us to heat our water to the desired temperature to increase the cleaning agent activity, resulting in the breakdown of soils and oils that have been ground into the tile and grout by way of foot traffic. The tile and grout are then agitated to remove the soil and oils from the surface of the tile as well as the porous areas. Finally, taking the time necessary to complete these steps is very important in order to achieve the desired results. Why use Lindsey's professional Tucson tile and grout cleaning service? First, convenience. Lindsey's Carpet & Tile Care takes care of the entire procedure, from moving furniture and replacing it to protecting the tile and grout from future soil and staining issues when cleaning is finished. Our service is completely hands off for our customers. Second, equipment. Lindsey's uses one of the most powerful truck mounted systems made. Our state-of-the-art system ensures complete soil and cleaning agent residual removal. If cleaning agent residual is left behind on the tile & grout, the result will be rapid resoiling. Third, education. Lindsey's Carpet & Tile Care is IICRC Certified and expertly trained and equipped to provide our customers with the highest quality tile and grout cleaning services. We also are involved in on-going education and certification. Lindsey's Carpet & Tile Care recommends semi-annual and annual cleaning programs for our commercial customers, depending upon traffic within the facility. Residentially speaking, the frequency would depend upon a few factors: customer preference, foot traffic, and whether or not there are children or pets present in the home. Lindsey's Carpet & Tile Care can help with determining how often cleaning should be completed in order to keep the tile and grout looking like new.